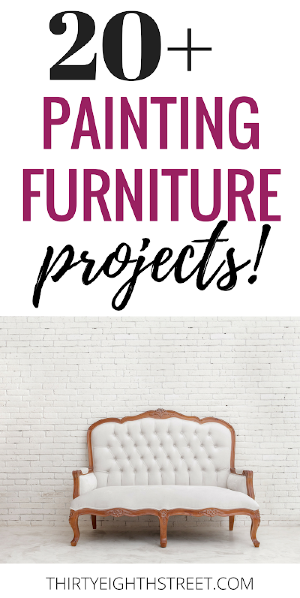 A Repurposed Furniture Project That Will Inspire You! Are you ready to have your mind blown? 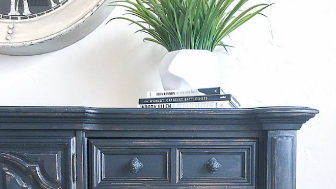 This repurposed furniture idea will knock your socks off and it will give you all sorts of inspiration for upcycling old furniture. What if I told you it was possible to create two pieces of furniture by repurposing a china cabinet. 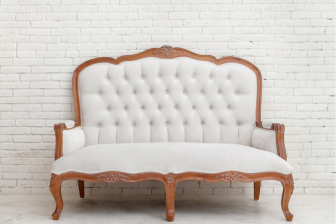 If you've followed us for for any length of time you know that we love to repurpose and refurbish furniture into show stopping pieces and we don't like to spend a lot of money doing it! 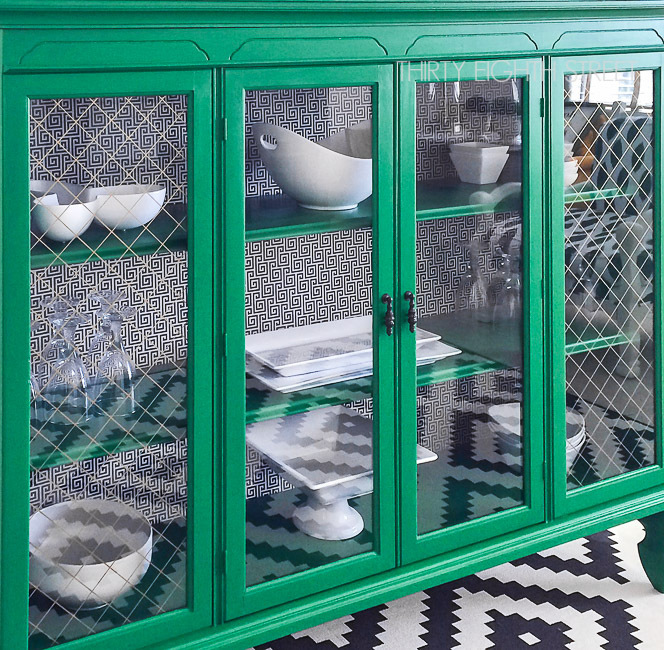 Today, we're going to show you how to create gorgeous repurposed furniture pieces from ONE china cabinet! You could create media consoles, buffets, or sofa tables from one china cabinet. That's two furniture statement pieces for the price of one! 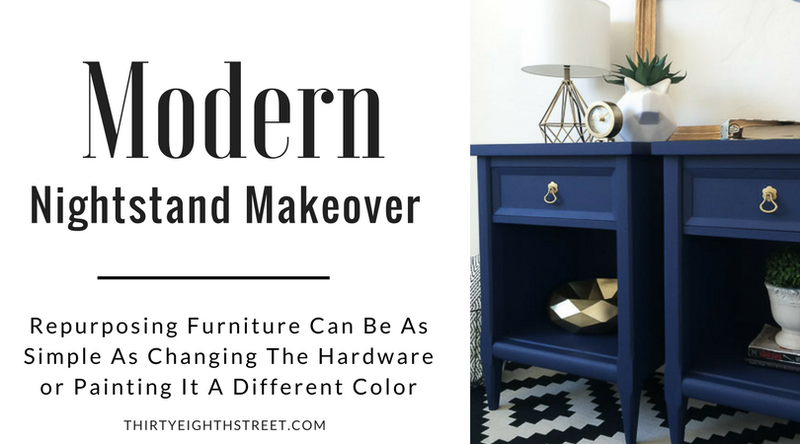 Disclaimer: We received paint products from General Finishes to complete this repurposed furniture makeover. This post may contain affiliate links. Read our full disclosure here. We're calling this upcycled furniture project "The Chesapeake Cabinet" which started out as an older beaten up china cabinet. It had chips, it had gouges and was collecting dust in a storage unit. This china cabinet was ideal because it came apart into two pieces. I love china cabinets that have an upper and a lower. No. 2- It's easy to add legs to each section to create a unique and stand alone piece. The upper section of china cabinets make beautiful custom cabinets and the lower section (depending not the height) are the perfect size to repurpose into media consoles, buffets or sofa tables and sometimes bathroom vanities. 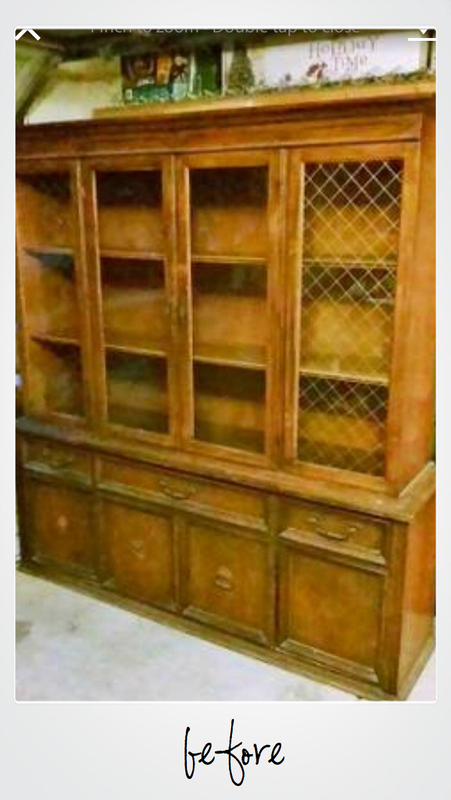 You can see additional examples of us doing that with this repurposed hutch or check out how we transformed the bottom of this china cabinet! In order to add legs we needed to beef up both the top and bottom of the cabinet. When you turn your piece of furniture upside down you may notice that your molding is not flush with the bottom. (As in the bottom of your dresser or hutch or buffet is actually lower than your trim lines along the front and sides of your furniture. That's okay, it's an easy fix! You'll simply measure and cut out a piece of wood and attach it to your base to create a new bottom. We used 1/2" pine, cut the boards to size, then attached them with wood glue and finishing nails before attaching the legs. 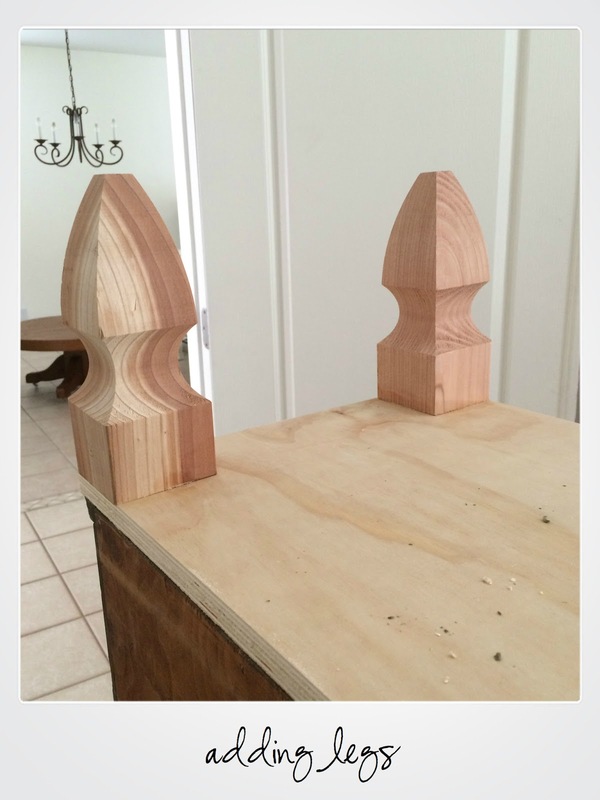 Now, let's talk about furniture legs for a minute. See the ones we used? Those aren't even "official" furniture legs. Those are fence posts from Home Depot. I think I paid $6 per leg. It's a super affordable option if you aren't looking to spend a lot for legs. Once the boards were secured, we attached the legs Home Depot fence posts to the bottom board with wood glue and screws. If you're looking for a wood legs Amazon carries a great variety of furniture legs. We painted the cabinet with two coats of General Finishes Milk Paint in Emerald and then sealed it with one of my personal favorites, General Finishes High Performance in Flat. The Prettiest Blue You Ever Did See! This was really simple furniture project! And bonus, I was able to get two furniture pieces for the price of one! Would you like to see more furniture tutorials just like this? 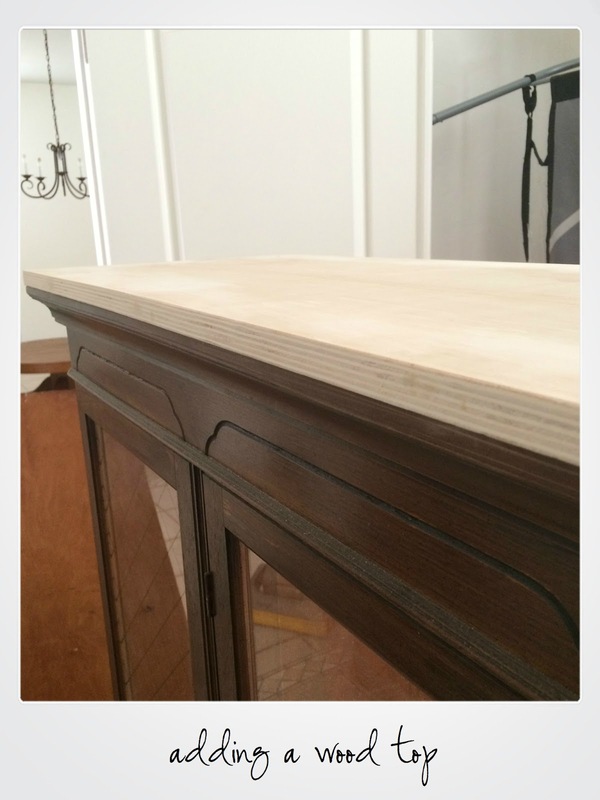 Stop by our Furniture Refinishing Tutorials page to see more! 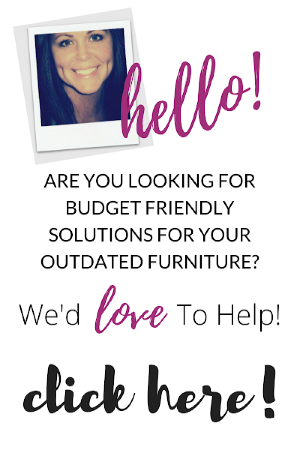 Do you have time for one more furniture makeover? We think our Balayage Inspired Media Console might just knock your socks off! This is seriously gorgeous. I love the black & white against that emerald paint. The white dishes...just love it! Once again my friend you knocked this outta the ballpark!! Great job! Oh my gosh I have a cabinet top that i bought the same legs from home depot and am putting them on the bottom just like this! I love that i can see for real how it will look and i love it! Great job. I bought square caps to bulk up where the legs go but i think your idea may work better. And i love your colors here. So pretty and cool! If I can figure out how to do tag, I certainly will ha! It weights a super ton so I need help moving it. I sold the bottom and just didn't have the heart to ditch the top since it is beautiful. I figured it would make a bookcase or curio type cabinet. I actually have two hutch tops I'm doing this to, but they are so awkward and huge I have been intimidated to start either one :). You have inspired me to dig in! Love this and and the color is great! Thank you for the lovely compliment, Megan! I love the transformation. It looks so modern with the new color and paper pattern. Nice job! Appreciate you stopping by, Erlene! Thanks so much! As always, you just knocked it out of the ballpark, girlfriend! LOVE this! I'm glad you liked it! This project was a fun to work on! Looks awesome! And what a lovely, vibrant color! Thank you, Mila! General Finishes Emerald is a show stopper! love this!!! Can't wait to see all the submissions, especially if they are like yours. I love the green with the black and white, I'm in love!! You did an incredible job with the flip, I want it!!!! 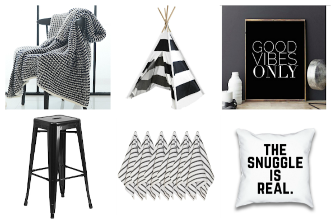 Thanks for posting at #WAYWOW Come back, I love everything you've posted, it would fit right in my home perfectly! I'd love to come party again! Thanks, Nikki! Seriously gorgeous flip! 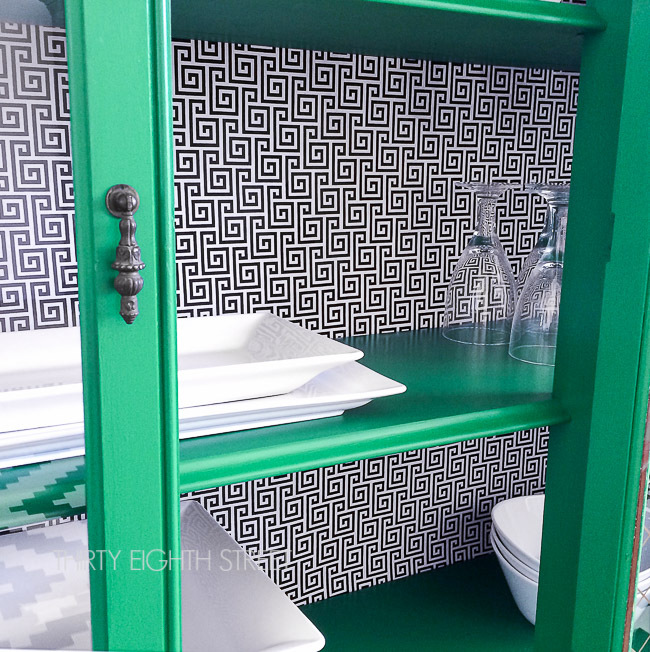 Love the green with the black and white geometric fabric! Thanks so much for sharing with us at the Best of the Weekend party. 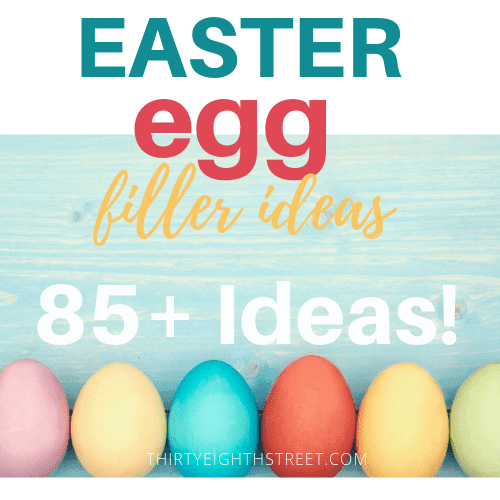 I'm looking forward to seeing more of your projects! Hi Jenna! Thanks for hosting. I'd love to participate again! Thanks! Love it so much that I had to feature it tonight! I'm honored, Jenna! Have a great weekend! I LOVE this transformation! The paint colour, the legs, the geometric pattern chosen... love everything! I'm featuring this project at the Talented Tuesday party this week. Hope you'll stop by and say hi!! Lindi! I'm honored! Thank you! Tara- Thanks for hosting and for stopping by! I'd love to participate again! See you soon..
What a beautiful job you did on this piece! I'm so glad that you shared this at "Best of the Weekend" so that I could discover it. I hope that you are keeping this to enjoy! Cute makeover! Thanks for joining Home Sweet Home! It hardly looks like the same piece, and I mean this in the best way! :) Lovely work, Carrie! You made my night! Thanks, Rachel! 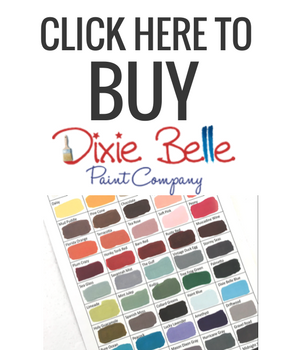 Featuring tonight on The Painted Drawer Link Party and thanks for sharing! Thanks also for the heads up on the contest! I'm stopping by from The Painted Drawer Link Party feature. This piece is brilliant! The Emerald Green with the contrasting fabric, and the feet...What a fabulous example of upcycling! Perfectly executed! This piece is beautiful!! 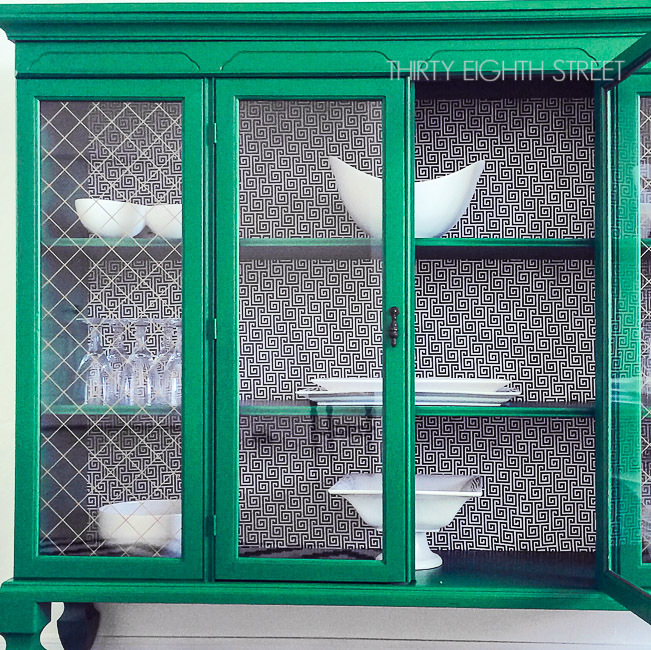 I used Emerald milk paint for my piece as well this month. I LOVE the color, and yours looks amazing with the geometric pattern on the inside. Gorgeous! Thanks so much for hosting us this month! Isn't GF's Emerald just lovely? It makes me smile every time I open the can. :) I'm so glad that you're participating in The Fab Furniture Flippin' Contest this month! 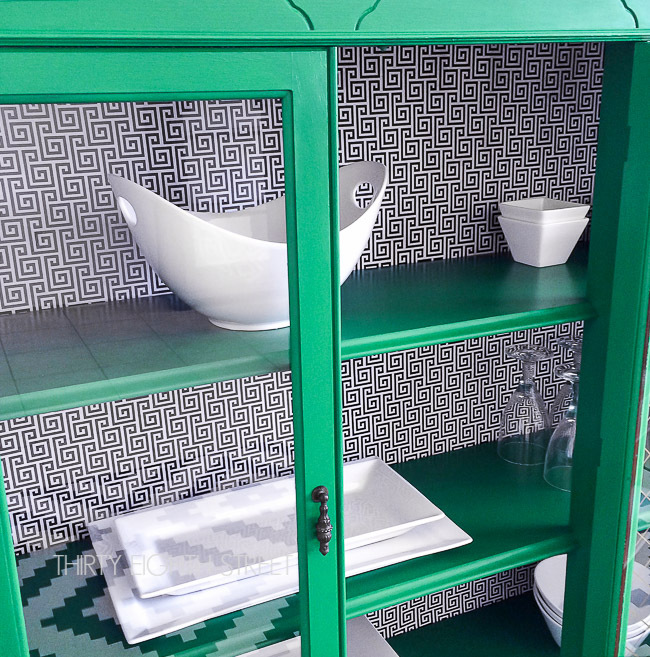 Love that you saved the top of that china hutch, great project and what a juicy bright green color! Love the floor staging as well, adds a nice touch ! It is a juicy bright green, Brenda! :) Thank you! That green is fantastic! Maybe I'll have to start looking at monster china cabinets differently in the future. Thanks for hosting! Look how beautiful. Love love love. I wish I had your creativity (since I seem to already share your old a** needs-a-refresh furniture, LOL). I'm sure that you are more creative then you give yourself credit for!